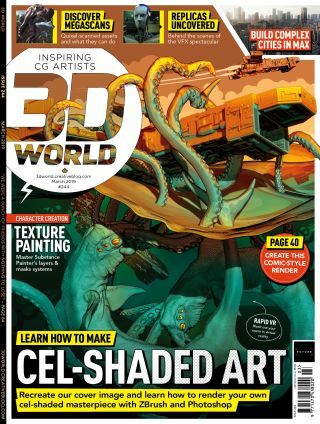 Become a better artist with the latest issue of 3D World. This issue, along with our usual reviews, inspiration and regular Q and A sections, we review the Wacom Cintiq engine and the latest version of Ziva, teach you how to create cityscapes in 3dsMax and master colour theory. Discover Quixel Megascans and what they can offer your projects. We talk to Quixel to find out what makes Megascans, along with its suite of bridging and creation tools, so special. These tools are rapidly gaining popularity amongst the CG community. Trevor Hogg delves behind the scenes of this historical visual effects spectacular, uncovering some of the tools and techniques used to solve problems in recreating some breathtaking action sequences. In this tutorial, we show you how to master your colour theory, allowing you to control your viewers emotion response, making your work more impactful. In this feature, we uncover the tools and techniques used by the artists behind the visual effects of Keanu Reeve's latest action film. Veteran trainer and 3D World regular Paul Roberts returns this issue to teach you how to create sprawling cityscapes using 3dsMax and Railclone, in order to easily distribute your assets across a large scene.